Let me start with a little bit about myself. I’m a risk taker, I’m not a stressor. I live a happy balanced life, I’m fit but I’ve never considered yoga to be a workout. I know a lot of people who religiously practice yoga, and I’ve always thought, ‘good for them, but it’s not for me’. My idea of a solid workout was a strenuous sweat fest that left you feeling like you were going to die, and yoga never seemed to fit that criteria. But always willing to try something new and have fun, I along with 2500 others, signed up for Wanderlust Thredbo 2016. As I drove down from the heart of Sydney, I had no idea what to expect. It was only when there were was two out of the six-hour car ride to go, that my friend (who lacks in as much flexibility and yoga knowledge as I do) and I came to the sudden realisation that we were about to make complete fools of ourselves. Realistically, it was too late to successfully perform a one armed handstand, but we thought some sort of basic knowledge at least would help – so the next 120 minutes were literally spent on a website, Yoga for Dummies. But everything changed at the end of the six-hour drive, as we were warmly welcomed into the gateway of pure bliss and heaven. The warm, welcoming, encouraging environment of Wanderlust was indescribable. Never would I have thought to come to Thredbo in the summertime, but the location was nothing short of perfect. The mountains up ahead built the walls of this warm positive community. As the sun shone through without fail each of the four days, it radiated a sincere and comforting sensation that this was a place of serenity, peace, love, healing and acceptance. Follow Your True North was the theme of the festival. As you spoke to different people, tried different activities and bonded with this community it wasn’t long until you learnt everyone had a different story and a different reason for coming along. I must admit, my prior yoga knowledge barely extended much further than your standard downward dog pose, and even with that I wasn’t sure if I was even performing that properly. 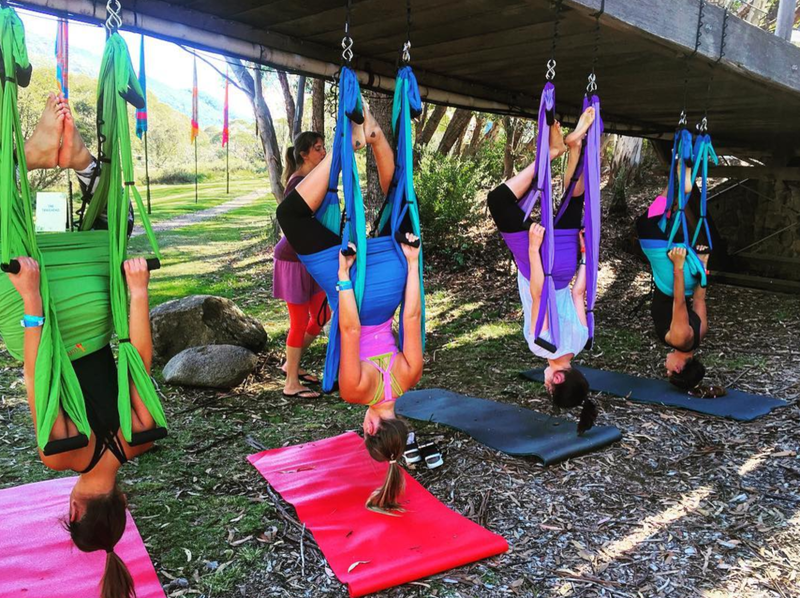 So when we were thrown into suspension yoga as our first activity, I was definitely excited as an adrenaline junkie, but struggled to fathom how I could possibly partake in aerial yoga if I couldn’t even master the most basic of poses on the ground. Wearing such beautiful, comfortable and yoga appropriate, The Upside attire, added to my worries of looking like we knew what we were doing based on our clothing but miserably failing. But it wasn’t long before our nerves and fears of failure were a thing of the past. es, we seemed to feel pain simply straightening our legs whilst others had there’s wrapped around their necks, but we finished the class without any major falls, face plants or tumbles (ok, maybe just a few). But the point was that we did it and everyone was so supportive and encouraging regardless of what level or standard we were at. No longer did it matter what we looked like or if we failed because it was all about giving it a go and finding our individual True North’s. From that moment, we dived head on in to anything and everything we possibly could. From hikes that gave you a different outlook and view on nature and finding that clear headspace to yoga on the very top of a mountain that yes made it hard to breathe because of the high altitude, but opened our lungs and heart to a new and different experience. This sincere and infectious energy was injected into us and soon enough we were spending any spare second practicing poses and moves that we’d learnt to try and further perfect. “Our hypnotism is endorphins,” said Partner and Festival Director, Jonnie Halstead. “You’re getting drunk on transformation,” and he couldn’t have been more right. Over the next few days there were motivational speeches, sessions that lifted us in the air where we would fly, hula hooping, horse riding, mountain biking, an inundated amount of group hugs and even yoga on paddle boards (which was beyond incredible) – but there was more to Wanderlust than just all that. In each session, there was a DJ mixing the tunes to sequence through and that music infused sensation continued well into the night. With jam sessions from SweetMix Kids, Mia Paris and Xavier Rudd to name a few, celebrations continued with such graceful, spacious, loving and non-judgmental dancing. There was no getting hungry either. From a continuous supply of protein bars to restore lost electrolytes from high intensity sequences to colourful, nutritious and fulfilling mason jar salads to my favourite, acai bowls, all bodies were fed and ready for more. Fancy some organics wine? There was even that starred in our Earth to Table fancy dinner event with only the most organic and fresh ingredients on our plates of our three-course meals. It’s only been a few days since my last Vinyasa Flow and soulful group Om, but I’m already craving it and need more. Before Wanderlust, I was definitely happy and balanced but not centered. Never did I think I would come out of the festival with a new love and appreciation for yoga and never did I think I’d ever consider it a workout! What I thought would be a four-day retreat turned out to be a four-day centering experience and a discovery of a new love and way of life. It was a humbling experience that I’ll never forget and recommend it to everyone. With expansions of the North American festival happening drastically around the country, there will be an opportunity for everyone to attend one too. I learnt that no matter what your level or experience is it doesn’t matter. It’s trying something new because when you least expect it, it might just find you. So put on you’re The Upside top and tights and go forth and search for your True North, I certainly found mine.